Since its launch at the Geneva Motor Show in March, the new Bentley Brooklands has captured the hearts of customers across the globe, with the first year’s production of this hand-assembled, luxury coupe already sold out. The lifetime production of this luxurious coupe will be strictly limited to just 550 cars, ensuring exclusivity. Deliveries to customers begin in the first quarter of 2008. 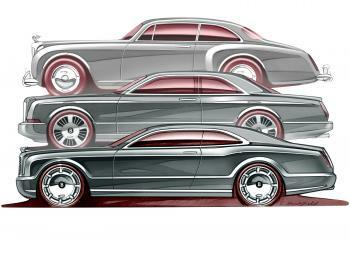 The Bentley Brooklands marks a return to Bentley’s heartland. For decades powerful coupes have been icons of the Bentley brand and the Brooklands continues that proud lineage. As a coupe, the Bentley Brooklands is unique, its remarkably spacious cabin providing the ultimate in first-class travel for four adults at any speed. The low, fast roofline with dramatically raked front and rear screens and muscular lines give the Brooklands a distinctively sleek, sporting stance. The effect is contemporary yet unmistakeably Bentley. Brooklands’ enhanced chassis provides the handling to match the awesome power of the 395 kW twin-turbocharged 6¾-litre engine, the most powerful V8 that Crewe, Bentley’s home for over 60 years, has ever produced. This legendary engine also develops the highest-ever torque output of any V8 automotive engine in the world, producing 1,050 Nm. o 0-100 km/h in 5.3 seconds. o Top speed of 296 km/h. o 80-120 km/h in 3.1 seconds. o New free-flowing air induction system and sports exhaust. o Very stiff platform and uniquely engineered chassis with specially developed 20-inch wheels and tyres as standard, that combine Arnage T handling with Arnage R comfort. o The largest diameter discs of any production passenger car on sale today. o Discs last the lifetime of the car and pad life is doubled, under normal driving conditions. o Virtually fade-free use time after time. · Most spacious rear cabin of any coupe in the world. · Bentley is the only manufacturer to offer as standard a cabin trimmed entirely with leather hides. · Full order book for first year, with lifetime production limited to just 550 cars. Such is the robustness of the engine’s architecture, the Crewe-built V8 engine has been at the heart of all large Bentley coupes for nearly 50 years. In 2007, the Bentley 6¾-litre, twin-turbocharged V8 saw a step-change in performance with a comprehensive range of enhancements for both Arnage and Azure. These included a more efficient and refined valve-train, re-profiled camshafts and more responsive, low-inertia turbochargers. These were complemented by a new six-speed transmission with semi-automatic function and Bosch engine management system. For the Arnage T, power increased to 500 bhp with 1,000 Nm of torque. The changes also enhanced refinement, improved durability and ensured compliance with the demanding European EU IV and US LEV II emissions standards. This engine represented the starting point for the new Bentley Brooklands coupe. For Brooklands, Bentley’s engineers have introduced a new free-flowing air induction system and a sports exhaust, together with a re-calibration of the valve-timing and engine management system. The result is record power from this hand-assembled 6¾-litre V8 engine of 395 kW (530 bhp) at 4,000 rev/min and an astonishing 1,050 Nm (774 lb/ft) of torque at 3,250 rev/min – the highest-ever torque of any V8 automotive engine in the world. The new engine endows the Brookland’s with super car performance, accelerating to 0-100 km/h in 5.3 seconds on its way to a top speed of 296 km/h. In-gear acceleration times are also greatly enhanced, with the coupe capable of accelerating from 80-120 km/h in 3.1 seconds. That instantaneous acceleration is recognisable from the driver’s seat as the renowned Bentley ‘wave of torque’ and is due in part to the V8 engine’s new twin turbochargers which operate with far greater efficiency at lower engine speeds, significantly reducing lag. The V8 engine is mated to a six-speed transmission with locking torque converter that provides an instantaneous response to the driver’s demands. A semi-automatic function allows manual gear selection for even greater driver control and, when driven to its potential, means stronger and faster acceleration in every gear. The Bentley Brooklands copes with the formidable power of its V8 engine thanks to a uniquely engineered chassis, developed from the Bentley Arnage, and an impressively stiff body structure. Strengthened steel in the A-pillars, door sills, rear-three quarter sections and cant-rails provide the Brooklands’ body with exceptional torsional stiffness. This contributes to the Brooklands’ sporting handling combined with superb levels of ride comfort that are in keeping with the large Bentley coupe tradition. Peter Guest, Head of Department, Body and Trim, elaborates. The independent, front and rear, double-wishbone suspension employs coil springs, computer-controlled adaptive, electro-hydraulic dampers and automatic ride height control with auto load compensation. Together, these deliver impressive body control during cornering, braking and acceleration. The fitment as standard of 8.5Jx20-inch wheels and 255/40 ZR20 Pirelli P Zero tyres, specially developed for Brooklands, also aids handling and roadholding. The very strong body also allows Brooklands to run with lower spring rates than the Arnage T, thereby achieving a level of ride comfort similar to that of the Arnage R. The body-hugging, lower-slung Azure-derived front seats provide a more sporting driving position, enhancing the sporting appeal of Brooklands, compared with its Arnage and Azure stablemates. As an option, Brooklands may be specified with new carbon/silicon carbide, cross-drilled brake discs, further extending the new coupe’s performance boundaries. Introduced on the limited edition Continental GT Diamond Series in 2006, the system features the largest diameter brake discs of any production passenger car on sale today. Measuring 420 x 40 mm at the front and 356 x 28 mm at the rear, with eight-piston callipers, the new brakes give an 8 kg reduction in rotating unsprung mass benefiting steering response, ride suppleness and acceleration. The lightweight braking system ensures virtually fade-free use, time after time, and superb resistance to disc distortion under high thermal conditions. Under normal driving conditions the brake discs will last the lifetime of the car. Furthermore, brake pad life is doubled compared with the standard braking system. 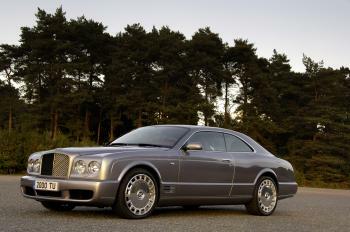 The Bentley Brooklands’ bloodline is a rich history of elegant, potent, two-door luxury coupes. For decades these have been icons of the Bentley brand and Brooklands continues that proud lineage. Bentley coupes from the fifties such as the Park Ward Continental S1 and the Continental R and T of the nineties became collectors’ classics and were a major influence on the character and design of the Brooklands coupe. Brooklands’ sporting pedigree is unquestionable. Its low roofline with dramatically raked front and rear screens, pillar-less, elongated glass area and graceful, prominent haunches lend Brooklands a sleek, purposeful appearance. The Brooklands roof is 13 mm (0.5 in) lower than the Azure and a full 47 mm (1.9 in) lower than a four-door Arnage. As the Brooklands was only ever intended for limited production volume, the design team was able to introduce features that call upon the unique coach-building techniques of Bentley’s craftsmen and women. The Brooklands’ fast flowing roofline is a perfect example of those skills. To provide the appearance of a ‘floating’ rear screen demanded by the design team, the rear quarter panel and roof can only be joined by hand – impossible in mainstream production. The exclusive character of Brooklands is further distinguished by ‘Le Mans’ front wing vents, a jewelled fuel filler cap, brushed aluminium ‘Bentley Brooklands’ treadplates and a dark-tinted steel Bentley matrix grille with optional Flying ‘B’ retractable radiator mascot. Its sporting intentions are reflected by larger diameter exhaust tailpipe finishers with rifled detailing to the inside surface. Brooklands also features unique under bonnet detailing with a brushed aluminium ‘6¾ Litre Brooklands’ engine plaque. Embossed Bentley logos appear on the intercoolers. Each engine bears the signature of the team leader who oversaw its hand-built construction in the Crewe factory. Brooklands rests on 20-inch alloy wheels – a first for the Arnage family of cars – in two distinctive styles. The 16-spoke two-piece Disc wheels are standard fitment with the 5-spoke, two-piece Sports wheels available as an option. Both designs, shod with Pirelli sports tyres, lend Brooklands an appearance of surefootedness, robustness and dynamism. As in every Bentley, peerless craftsmanship and bepoke finishing are to the fore. Every item of trim, be it veneer, hide or chromed bezel, uses authentic materials. All interior brightware, for example, is made from stainless steel and is as spectacular as any Bentley of yesteryear. The limited production volume allows the Brooklands design team to capitalise on the unique skills and techniques of Bentley’s craftsmen and women. For example, the cabin headlining is made entirely from leather, making Bentley the only car manufacturer in the world to offer as standard a cabin entirely trimmed with leather hides. The entire headlining is tightened and finished by hand to achieve the desired quality of finish, a process that takes years of skilled practice to perfect. By using the Arnage rear cabin structure, Bentley’s engineers have provided a vast rear seat area that is larger than any other coupe in the world. The individual, electronically reclining rear seats are set 100 mm (4 inches) further back than on Azure, benefiting leg room. They are also set 25 mm lower than the Arnage, resulting in a headroom of 939 mm – just 24 mm less than in the large saloon. Brooklands uses the new Azure’s front seats with their integrated seat belts and side airbags. Major features include bi-level electric lumbar adjustment, a massage function, as well as tilting and extending front cushions. Brooklands’ customers will be able to specify their car in an extensive choice of ‘standard fit’ colours which includes 42 exterior paints (including new Venusian Grey and Titan Grey), 25 hides and three veneers. In common with all Arnage family models, the wood veneers (including new Dark Stained Vavona) are premium quality and unbleached for a more natural appearance. Three new hide colours (Anthracite grey, Newmarket Tan and Cashew) are introduced with Brooklands. Customers may also tailor their cars to their individual specification through Bentley Mulliner’s bespoke colour-matching service and selection of hide colours from previous model years. Brookland’s sporting atmosphere is emphasised by the distinctive new ‘Sandwich’ piping which sits flush with, rather than proud of, the stitching. In addition, a range of optional engine-turned aluminium and carbon fibre veneer inserts complement the Mulliner aluminium foot pedals and footrest.